As soon as Peter O'Brien heard his named called by the New York Yankees in the second round of the 2012 MLB Draft, he knew it was time to go to work. 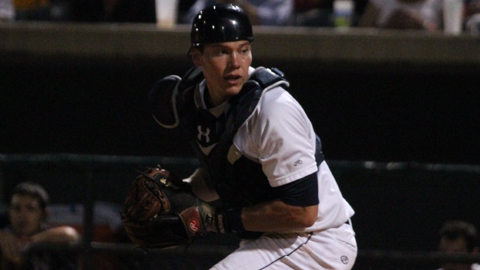 The former first-team All-Atlantic Coast Conference catcher had been drafted in the third round in 2011 by the Colorado Rockies out of Bethune-Cookman University, but decided against joining Colorado and instead returned to school and transferred to the powerful University of Miami (FL) program. O'Brien couldn't be more pleased with his decision. He put up stellar numbers in his only year at "The U." O'Brien finished the 2012 college season playing for legendary coach Jim Morris and batted a team-best .340 with 10 home runs and 40 RBI. Miami's season came to an early end as they were upset at home by the Missouri State Bears at Alex Rodriguez Park. Although O'Brien and his teammates were bummed about the loss, Peter knew it was on to bigger and better things. He hoped that he could someday join the player that his collegiate stadium was named for as a star at the big-league level. Following Miami's loss, Peter reported to the Yankees' Gulf Coast affiliate. He appeared in four games, batted .348 before quickly being promoted to Staten Island. With the "Baby Bombers," O'Brien showed why the Yankees drafted him 89th overall as he hit a whopping 10 home runs and 34 RBI in only 52 games at Staten Island. O'Brien went into this past offseason knowing that he was ready to make another jump. This time it was to full-season ball as the Yankees assigned the bilingual catcher to Charleston. "I worked hard all off-season and once spring training started I worked even harder," said O'Brien. "I thought everything went great." The coaches evidently agreed as O'Brien was promoted to start the 2013 season with the RiverDogs. "This kid works really hard and he is really smart," said RiverDogs first-year manager Al Pedrique. "He has a very strong arm and a lot of power in his bat. "His offense is good, but it's his defense that needs work," Pedrique added. "The great thing about this kid is that he always wants to learn more. He always listens and asks questions. You can't ask for anything more from a young player." Peter knows he is in for a long season with the RiverDogs. The 140-game schedule has very few off days, but he's ready. "I'm in the best shape that I have ever been," O'Brien admitted. "I worked all offseason for this and now I am just ready to get out there and help this team win and learn as much as I can." While O'Brien showed off his powerful bat a year ago with Staten Island, he still struggled a bit defensively. "I think Peter was a great catcher for us," said former Staten Island teammate and current RiverDogs pitcher Taylor Garrison. "Peter could no doubt hit the ball hard and far," said Garrison. "His struggles were with his batting average. I have seen him working with his hitting this spring and he's seeing the ball better. Defensively, the man has a cannon for an arm. He needs to work on receiving the ball better and, again, that's what he did while in spring training. "I think he is a standout catcher," Garrison added. "He was great for our staff last season in Staten Island because he always called great games for us. He always knew about all of the oppositions' hitters, too. He knew where they liked the ball and where they couldn't hit it. He will do great here in Charleston, and it will be nice working with a familiar face behind the plate." The upside is clearly through the roof for young Peter O'Brien. Now it's time to take the wait-and-see approach as he enters his first year of full-season baseball. His goal is simple: get better every day.